It is 2001 and the police constable’s girlfriend is murdered in a fit of jealous rage. When the constable realizes what he has done, he manages an elaborate cover-up. Only one person knows the truth. Flash forward to 2012. Anne Brown is still running her late uncle, Bill Darby’s, detective agency after spending four or five years as his assistant. One day, the postman delivers an eleven year-old letter. The letter is addressed to her uncle from a woman named Carolyn Jollimore. She says she has evidence about a murder and begs for help from Darby. But Bill Darby is dead. And when Anne looks up the letter’s author, she finds that Jollimare too is now dead. 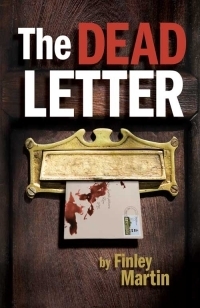 Troubled with the evidence at hand, Anne must decide if she should investigate this eleven-year old murder. Finley Martin was born in Binghamton, New York and grew up in Scranton, Pennsylvania. He received a B.A. degree in English at the University of Scranton, and during the 1960’s he served as an officer with the United States Marine Corps at posts in America, the Caribbean, and Asia. After he returned to civilian life, he worked as a free-lance writer, p.r. consultant, and photographer and became public relations director at International Correspondence Schools. In the 70’s he received an M.A. from the University of Ottawa and a B.Ed. from the University of Prince Edward Island. For many years he taught English literature at high school and writing courses at university. He has also worked as a truck driver, labourer, carpenter, boat builder, and deckhand aboard commercial fishing vessels and passenger ferries. During his writing career he published numerous magazine and newspaper articles, poetry, and short stories in Canada and the U.S. 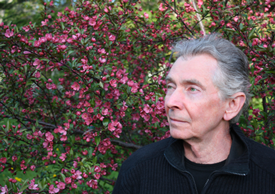 He produced a mini-series for CBC Radio and has given numerous poetry readings. He authored three books: New Maritime Writing, Square Deal Pub., Charlottetown, PE; A View from the Bridge, Montague, PE; and The Reluctant Detective, The Acorn Press, Charlottetown, PE. 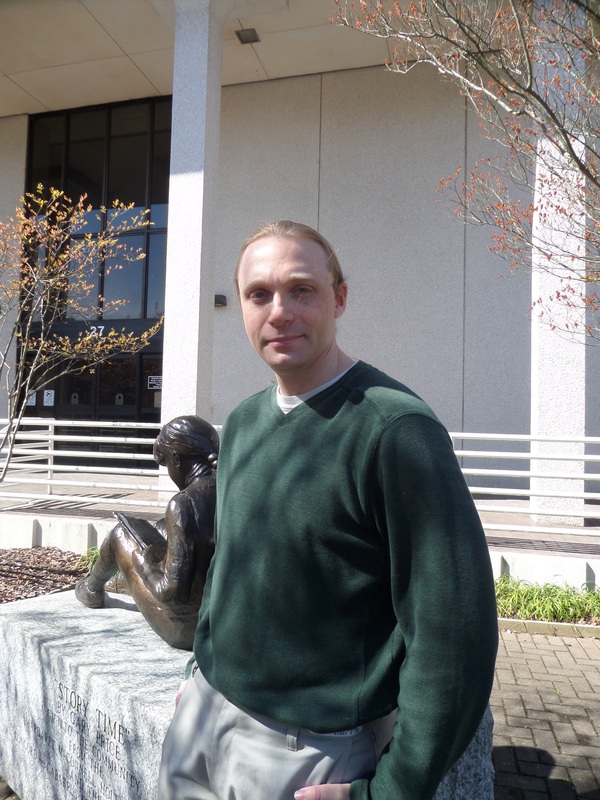 A native of Honeoye, New York, Andrew Cratsley lives in North Carolina. Keepers of Runes and the Tower of Shadows is his debut novel. Cratsley is a lifelong fan of fantasy books, films, and RPG-style gaming. A champion of literacy issues and proud supporter of the World Literacy Foundation, Cratsley will donate a portion of the proceeds from Keepers of Runes and the Tower of Shadows to the World Literacy Foundation’s fight against illiteracy. Q: Congratulations on the release of your latest book, Keepers of Runes and the Tower of Shadows. What was your inspiration for it? A: I can’t point to specifics, but I would blame a life long obsession with fantasy in the form of movies, books, and RPG’s. A: Corinth is a young elf who obsesses with righting the injustices of the world, but like many so young; he must learn himself and the full reality of the world around him. His 3 companions share his depth and face similar transformations throughout the series. A: The road is treacherous and painful, but is equally rewarding to complete. It’s an exciting journey interrupted by many writer’s blockades. A: Concise writing and appropriate word choice is what I value most. Adding unnecessary content makes a work read like a weather forecast. A: Not at all. I’m excited and eager to see what my efforts will create. Not all days are fruitful, but the good ones are amazing. A: I’m still figuring all of that out, but the vampire in me releases my creativity after sunset. I don’t why I was born with this internal clock, but it works. A: Success is a state of mind, not a list of assets. A: Life should be about achieving happiness and our first step is to figure out what is truly important. This is often difficult to figure out, but you should realize your passions and cultivate them. A: It does take a certain obsession to follow through with such a task. I think something unique drives each of us authors, and the desire to finish what I started is fueling my obsession. A: Thank you for taking the time to get to know me, and of course my work. I hope you enjoy, because the story has only begun! A splendid and magical tale with a captivating storyline, extraordinary characters and a plot brimming with action, intrigue and adventure, Keepers of Runes and the Tower of Shadows is a fascinating read that captivates from page one. 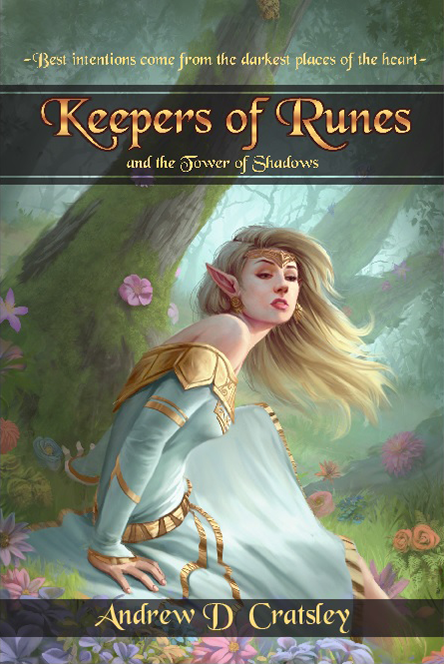 Resplendent with characters that come to life within the novel’s pages, Keepers of Runes and the Tower of Shadows is a beautifully-written, imaginative, and inventive tale. With its strong central female characters, Keepers of Runes and the Tower of Shadows offers a refreshing diversion from fantasy tales that focus largely on male protagonists and male supporting characters. When 12 year-old farm boy Shiloh Williams is sent to stay with his estranged grandfather, he discovers a mysterious new world inhabited by ‘Movers’. The Movers live in symbiotic harmony with one another, except one extremely powerful Mover who has stolen the town’s most precious artifact, the Eternal Flame. Shiloh investigates his supernatural surroundings, makes new friends, and begins to think of the town as home. However, just as soon as he starts to fit in, he realizes his newfound happiness is about to come to an abrupt end. One decision and one extreme consequence are all that remain. Shiloh Williams walked along in the late-afternoon heat, on his way home from the town of Salem. The lanky twelve-year-old brushed his sweat-soaked, brown hair away from his blue eyes with one hand while trying to finish the ice-cream cone he carried in the other. His bare feet were relieved to step off the asphalt main road and onto the narrow, shady dirt path leading to his home. The dusty, dirt lane was flanked by a vast cornfield to one side and towering black willow trees and intertwined brush on the other. Shiloh inhaled the sweet scent of honeysuckle as he licked the cone, gazing toward the two-story, white Victorian house in the distance. The house was his home, and the cornfield part of his family’s farm. One of the few farms left in the area, his father always liked to mention. Shiloh was in a good mood: partly because he had spent the day in town playing with some friends, but mostly because this was his first actual vacation day of the summer. Until today, he had been working on the farm all day every day, since school ended. When his father told him he was receiving a two-week break, Shiloh decided he was going to make the most of it and be thankful he didn’t have to work another day in the brutal July heat. 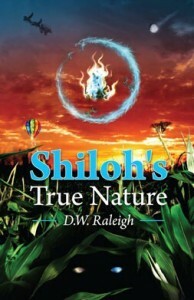 As he strolled along the dusty path, Shiloh heard something rustling in the brush beside him. He turned his head and saw two large black birds only a couple of feet away. The birds cawed as they boldly jumped from branch to branch trying to keep pace with him. He assumed it was the ice cream they were after, so Shiloh tossed the remainder of the cone toward the brush and watched as the birds descended upon it. Farther along, Shiloh spotted an expensive-looking, black car in front of the house. It was parked next to his father’s battered, old pickup truck, which made any other vehicle look nice. There was a man leaning against the rear of the car wearing a black suit and cap. Shiloh found that strange, considering he was dressed in a white T-shirt and shorts and had been sweating since he stepped outside that morning. As he drew closer to the house, Shiloh realized his hands were sticky with ice-cream residue. He wasn’t supposed to be eating sweets this close to his suppertime, and knew his mother would scold him if she found out. So he slipped into the cornfield to let the giant stalks conceal his five-foot frame until he could reach the back of the house to wash off undetected. He quietly snuck through the field and came up behind the giant stack of hay bales perpetually piled at the rear of the house. After glancing around to make sure it was clear, he crept up to the porch and over to the rusty, old spigot. He winced as he slowly turned the squeaky faucet handle, hoping the noise didn’t make it through the kitchen screen door just a few feet away. As Shiloh cleaned his hands, the aroma of his mother’s cooking filled his nostrils, while the sound of arguing voices filled his ears. When his hands were no longer sticky, he quietly moved over to the back door, and stopped when he could hear the discussion in the kitchen. He immediately recognized one voice as his father’s, but there was another, unfamiliar, rough-sounding man’s voice. It must have been whoever came in the black car, he thought. Listening intently, Shiloh was startled when something rubbed against his leg. It was one of his cats, Lovie. The gray and black tabby mix rubbed her face against his anklebones as she walked figure eights between his legs. Shiloh knew if Lovie was around, his other feline, Cheepie, couldn’t be far behind. He looked over his shoulder toward the faucet and found the other gray tabby, one that looked like a miniature tiger, entranced by the remaining water droplets dribbling from the nozzle. “I’ll not be insulted by the likes of you, Joseph Williams. Good day,” the man huffed. Shiloh heard footsteps, followed by the front door slamming. He was curious about this unfamiliar man, so he leapt off the porch and ran up along the side of the house. In his haste to see the stranger, Shiloh slipped on some pebbles and fell just as he reached the front corner of the house. The man immediately turned toward Shiloh scowling. Shiloh looked up at the stranger, but the bright sunshine kept him from distinguishing any of his features. The one thing Shiloh did notice was, like his driver, the man was dressed all in black, except for a hideously bright orange tie. The man’s gaze was broken as two black birds descended and began attacking him. The man quickly ducked into the rear of the car, the birds turning their attention to his driver, who ran around to the other side to enter. As the car pulled away, Shiloh noticed it had a peculiar, black license plate with orange lettering reading HAINES. “What? No! I’ll work the fields alone and eat dirt before I let that man get his hands on this land, Mary,” Joe stubbornly declared. Joe chuckled slightly and Shiloh smiled to himself, thinking about the easy way his mother was always able to diffuse his father’s anger. “He’s not going to be happy about it,” Mary sighed. “I won’t give you a break, but I will give you dinner. Go wash up,” Mary replied with a giggle. Shiloh heard a chair slide across the kitchen floor and waited until the footsteps faded before opening the screen door. When he stepped through the doorway onto the black and white tile, he found his mother’s tall and slender frame at the sink. As Mary washed her hands, her long sandy-blond hair was illuminated by the sun shining in from the window above the sink. After she dried her hands, Mary turned to open one of the nearby wooden cabinets and said, “No . . .” pointing in Shiloh’s direction and downward. Shiloh looked around in confusion. “. . . I’m making dinner and those two are not coming in here,” she finished. Shiloh looked down and realized she was referring to the cats lingering in the doorway. “One keeps trying to drag dead mice in the house. And the other keeps eating bugs, which wouldn’t be so bad if he wasn’t throwing them up all over the place afterward,” she continued. A tight-lipped smile rolled across Shiloh’s face as he turned to shoo the cats back out the door. Shiloh looked down at his T-shirt to see a couple of stains from his earlier treat. “Oh . . . that was from earlier this afternoon,” he replied with a wide grin. The family dinner was relatively quiet. Shiloh tried to stuff himself so he wouldn’t be lectured by his mother about eating ice cream before supper. He avoided eye contact with his father, because after hearing Joe grumble about all of the farm’s problems, he feared he might lose his time off. When he finished, Shiloh took his plate to the sink and tried to make a hasty retreat out the back door without saying a word. However, it wasn’t to be. “Hey . . . take a seat,” Joe called, pointing to Shiloh’s empty chair at the dinner table. Shiloh walked back to the chair feeling certain his father was about to revoke his vacation time “for the good of the farm.” He looked up to see his father leaning forward with his elbows on the table and his large callused hands folded. Joe was a tall, muscular man with perpetually unkempt, light-brown hair, piercing blue eyes, and his face always appeared to need a shave. “What?” Shiloh responded in shock. “You’re going to spend a couple weeks with your grandfather,” Joe answered pointedly. “Yeah, I wanted a break to have some fun with my friends. Not a break where I’m sent away to some strange place . . . I’m not going!” Shiloh’s voice shook with anger. Joe, not the kind of man to listen to long protestations, replied, “You are going. End of discussion.” He returned to his meal. Slamming his hands on the table, Shiloh rose from his chair, and walked toward the back door. “Get back here,” Joe called, as Shiloh forcefully pushed open the screen door. He heard his father yell, “Shiloh!” but he ignored him and ran into the immense cornfield. He ran through the field until he grew so tired he had to walk. He continued walking until he found himself on the far edge of the field, where he stepped out onto a narrow dirt trail that surrounded it. Shiloh looked back to see how far he had come and the farm’s old horse barn caught his eye. The faded, maroon monstrosity had fallen into disrepair, but the barn’s current residents, Rikki and Peco, loved it for some reason. It was their big, red dilapidated mansion. When his gaze drifted across the field, Shiloh saw his home in the distance. The towering cornstalks obscured all but the top half of the house. Taking a couple of steps backward, trying to find a better view, he suddenly lost his balance. He began tumbling down a slick embankment covered with reeds and into the swampy marsh that separated his family’s property from the Delahanna River. Shiloh was uninjured by the fall, but landed on his backside in the mud. He sat for a moment to catch his breath, gazing toward the river stretching out in front of him. He saw some Great Blue Herons standing nearby in the marsh. The large gray birds were motionless, with their S-shaped necks pointing up into the distance. Following the herons’ gaze, Shiloh saw the large factory to the south. He knew the factory was there, but never paid it much attention. It was practically invisible due to the thick cluster of hickory trees lining the rear of the farm. The factory’s most distinguishing feature was an enormous cylindrical brick smokestack with a giant, orange H on its side. The huge tower emitted a perpetual gray smoke that seemed to linger in the air. Hearing voices in the distance, Shiloh turned back toward the river. An old fishing boat was anchored just offshore with some young people frolicking around the deck. He watched as a young man jumped from the deck into the river. “It’s freezing!” the young man hollered, emerging from the water. Shiloh smiled, remembering how he used to love the crisp bite of the river water on a hot summer afternoon. His parents wouldn’t allow him to swim in the river anymore. They said it was too polluted and dirty. Straight across the river were some lights from the town of Old New Castle. Just beyond that was Pike Creek, where his grandfather lived and where he would apparently be going the next day. This made him think of the things he’d be missing in the next two weeks: going swimming, the carnival, spending time with his friends. Thoughts of his impending departure made Shiloh feel sick to his stomach, so he tried thinking of something else. He looked around and noticed several gray puddles of water with a number of long-stemmed, gray wildflowers growing out of them. He frowned because he couldn’t recall ever seeing a gray flower before. He plucked the closest one and thought it was a wild daisy of some kind. Another flower grew out of the puddle right before his eyes, taking the place of the one he picked. This second flower was not gray, but golden yellow with a black center. Though startled, Shiloh scowled and dismissed the peculiar occurrence, recalling how he’d seen colorful mushrooms grow right before his eyes while working very early in the morning on the farm. As the sun began to set, Shiloh climbed the embankment, deciding he had better return to the house. He chose to walk back through the cornfield instead of the path along the edge of the field, because it was shorter. He came to regret that decision when the sunlight faded and the tall cornstalks blocked out what little light was left in the sky. To make matters worse, it was a new moon, so there was no heavenly light to guide him. In the darkness, the size of the farm became more apparent than ever. Shiloh walked and walked, seeing only dark rows of corn ahead of him. He knew he would escape them eventually, but not knowing exactly where he was made him uncomfortable. The odd collection of noises echoing out of the darkness only added to his discomfort. Shiloh dismissed some fluttering and flapping sounds, thinking it was probably one of the Great Blue Herons he saw earlier in the marsh. He then heard an odd, thumping sound, as if something was running around. He tried to dismiss that as well, remembering his father had mentioned seeing red foxes in the fields. Shiloh had never seen a fox on the farm, but supposed one could be the source of the noise. The thumping sound seemed to grow closer and closer, but every time Shiloh stopped to listen, it would cease. The louder the noise grew, the more Shiloh’s heart raced. He tried to ignore the sound, focusing into the distance to locate his house. When the thumping became so loud it seemed just a step away, Shiloh panicked, breaking into a run. He sprinted along until he tripped, falling forward onto the ground. Shiloh remained still and listened for a moment, but the only sound he could hear was his pounding heart. Looking behind him, down the corn row, he saw an indistinct dark mass just a few feet away. Fear gripped Shiloh, who now thought only of escape. He turned his head around, thinking if he could just stand he might be able to outrun whatever was back there. He was shocked to discover a second dark figure blocking his path. The second shape was lower to the ground, with glowing eyes, and it was growling. Shiloh didn’t know what to do, but figured whatever it was would have to start with him being on his feet. He took a deep breath and readied himself to stand, but before he could, the second dark figure charged him. He placed his hands over his head, preparing for an attack. However, no attack came. The figure leapt over him, chasing whatever was behind him down the corn row. Shiloh stood and sprinted away as fast as he could. As he neared the edge of the field, he could hear a loud, fierce growling and tussling behind him. Resisting the temptation to look back, he broke through the edge of the cornfield and ran straight into the house. 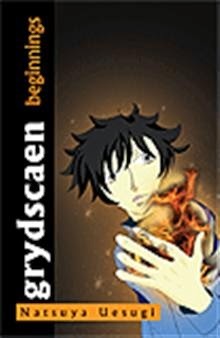 grydscaen by Natsuya Uesugi Book Blast – Win a $25 Amazon Gift Card! Follow the lives of the main characters as they come together in the backstory to grydscaen:retribution, the fi rst volume of the grydscaen saga. Faid is tired of life on the run in the Echelons, trying to keep his psychic power in check, he founds the Packrats establishing a safe haven for psychics. As a hacker he uses his jack to support his neurocyne habit. Lino is recruited by the Psi Faction and is sent on a mission to kidnap Faid. Riuho, Lino’s half brother becomes a prisoner of the Elite military and they experiment on him, train him and subject him to mind control, then send him out on a mission. On his return, Riuho is set on escaping and recruits Faid who hacks into the Psi Faction systems. They escape and return to the Packrats leading up to the start of grydscaen:retribution. Pump Up Your Book and Natsuya are teaming up to give away a $25 Amazon Gift Card! This giveaway begins April 28 and ends on May 9. Winners will be contacted via email on May 10, 2014. “Uh . . . thanks, Sally.” I hesitated on the threshold of the wood-paneled and carpeted inner office. “I . . . I . . . She was a student in my summer literature survey course.” I began to sweat. “Hampton Clarke retired just last year. We’ll call on him to finish the semester while we look for your replacement.” The dean turned to his desk, picked up a sheet of paper and thrust it at me. I scanned it: at least it said nothing about moral turpitude. I could deny nothing. I had violated the rules, thinking I could get away with it. I’d used Durwood Gregg’s beautiful daughter, flagrantly, irresponsibly, and then wanted to leave all that behind; close the summer dalliance like a chapter in a book. I still hadn’t told her. It would have been the old story: seduced and abandoned. “Here.” Dean Graham’s voice was harsh as he held a pen under my nose. “Let’s walk. I’ll tell you.” A dry wind rustled more fallen leaves across the path under our feet and intermittently carried the notes of the tower clock to our ears. Chimes followed by two solemn strokes. Two o’clock on a sunny Saturday afternoon, yet I was oblivious of the beauty of the day, the glowing fall colors and the crisp air: my world had crumbled. I told Jim everything as we shuffled through the swirling leaves toward the chemistry building, my voice shaking with self-pity. Jim made surprised and sympathetic noises, wondering if, rather than the golf course, we should go to Kenny’s Pub near campus to talk over the situation. “Eric?” he called, almost under his breath. “Yes?” I answered, again unprepared for that unfamiliar bass. “My God, my God, who is this?” That unfamiliar voice boomed into the emptiness. I shrank against the wall, needing but fearing to look again in a mirror. I must fit the pieces of the puzzle together, somehow. Amid the confusion of conflicting impulses and ideas, I remembered my half-serious invocation to the Devil. Had he instantly fulfilled my wish to be somebody, anybody, else? Could I have traded the eventual fate of my soul for this new body? I couldn’t have been serious; I didn’t even believe in the existence of a soul. But if there is no soul, what was left of “me” in this stranger? Does the self then reside in memory alone? I’d willed to become someone else and had no one but myself to blame for the results. The irony struck me like a blow: a tremendous practical joke by the Devil to punish me for having slighted and scorned Diana, in the process betraying my better self. I had asked to give myself to the Devil, but was now in the form of someone who had given himself away utterly. To God! Perhaps I was being punished for my irresponsible sensual appetites. In my present form, it would surely be more difficult to satisfy them. Perhaps the Devil is a reformer? The essence of that outcry on the stairs had not been my invocation to Satan, but my fervent wish to be someone else. Had I precipitated this disaster by wishing it? I remembered Freud’s remarks on “compelling thoughts” that primitives and neurotics believe actually control reality. Perhaps, after all, under certain circumstances, they do? I dried my face on paper towels and cleaned the sink and then began searching my clothing for identification. In a pocket of the robe, I found a handkerchief and a battered wallet containing a five-dollar bill and a familiar card: a meal ticket for the student cafeteria. The name “Anselmus” was scrawled in a bold, black hand at the bottom. I assumed this was my own name—but I now must try to find out who and what Anselmus was, where he was from, and what monastic order he belonged to. Could I concentrate enough to recall Saint Anselm’s argument? If my memory was correct, it went something like this: “The fool says in his heart there is no God. But even he would agree that God is something than which nothing greater can be conceived, including all perfections, such as absolute goodness, omniscience, omnipresence, and existence in reality. If one can conceive of God at all, one is forced to concede that He exists, otherwise something greater could be conceived.” Not bad, but after all, merely a slick manipulation of words and ideas. I smiled. At least I could still put two coherent thoughts together. Irrelevant, but coherent. Madmen can do the same, though, can’t they? Anselm. Anselmus. Yes, maybe I had seen a black-robed figure on campus. Normally, I avoided the school on my off days. Perhaps the monk never came here on Mondays, Wednesdays, and Fridays, when I teach . . . taught. But if I, Eric, now inhabited the monk’s body, where was his essence, his “soul?” Now that my “soul” seemed trapped in a monk’s body, I’d have to behave—temporarily, I hoped—like a monk. And how was that, anyhow? Should I be addressed as “Brother” or “Father”? It would be the latter if Anselm—if I—had been ordained a priest. By this time, I’d reached the main door of the building and paused. I had begun to identify “me” with “Anselmus”—but what else could I do? Before I tried to claim any of my own—of Eric’s—possessions, I must try to discover what had happened to my real self, my body, while I was forced to “be” Anselmus. “He looks like the devil to me,” replied the other dryly. The student health service at the end of the hall offered a temporary refuge. I hesitated with my hand on the doorknob. Would the nurse see me as I’d just seen myself in the mirror? 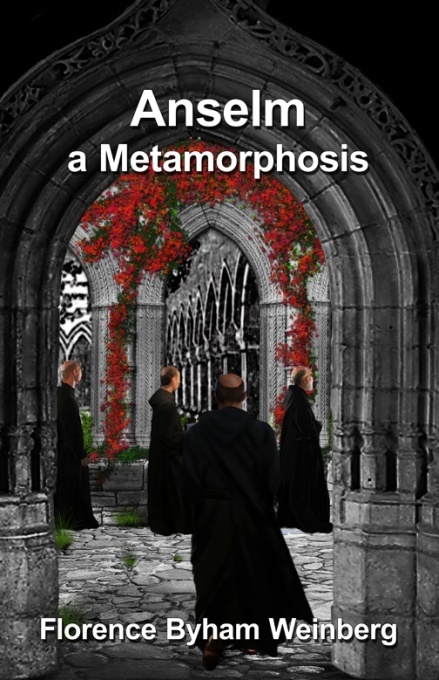 Maybe “Anselm” was merely my hallucination. I opened the door with a jerk. At the moment there were no students in the office. I sat in a straight chair while the nurse got out cotton, alcohol and materials for a bandage. She bustled over to me, an alcohol-soaked swab in her hand. “This is going to sting, now, Father,” she said in a singsong. “Perhaps I will, Miss Cunningham.” I stood up, smiling. How should I sign? Obviously, I could only write the priest’s name. Taking up the pen, I wrote “Fr. Anselm.” It was as far from my own over-precise Palmer penmanship as possible. The heavy black scrawl was identical with the signature on the card in my pocket. “Father, are you having trouble focusing?” Miss Cunningham asked in alarm. “Oh, it’s not that—it’s just my head; I have a terrific headache. I’ll be all right. And thanks so much for fixing me up.” I touched the bandage in a sort of salute, then turned unsteadily and re-entered the hall. I paced up and down the corridor past the student cafeteria that emitted the odors of stale frying fat and onions I usually found nauseating. Today, it smelled good. The obsessive rhythm of one of the Beatles’ recent recordings, “Nowhere Man,” pursued me as I walked. Instinctively, I clasped my hands behind my back in a priestly gesture. What should I do now? I was obviously known on campus—even Miss Cunningham knew me—but how was I to find out who I was without appearing ridiculous? “Well, hey, you know, it’s late, but we still have plenty of chicken and dumplings on the steam table. Enough for seconds . . . and thirds,” he smirked, glancing sidewise at me. “Well, it’s there waiting for you, Father, if you want it. Think it over.” He smiled as he moved away down the hall. “It’s nothing, Diana,” I replied. Her eyes suddenly brimmed with tears. “I’m sorry I am burdening you with an unwanted confidence at a time like this, but since you’re a teacher as well as a priest, you can understand the problems better than anyone else. It’s Eric—I’ve told you so much about him—and you know I want to marry him. He wants to wait, but I was still sure I could persuade him. But now Mom and Dad won’t let me. They think he’s irresponsible—unstable, they call him—and besides, he’s a Protestant. I love him and I don’t care. I’d elope with him this minute, but Professor Stevenson says Dad just had him fired and he has completely disappeared! Oh, Father Anselm, I’m so worried! He could be desperate! Can you help us find him? Can you bring him back to me?” She burst into sobs and slid slowly to her knees, then to the floor. I stooped and picked her up tenderly, with amazing ease, and cradled her like a child. My forehead, my lips, my body burned in fiery anticipation of her cool kisses, kisses that could only increase my sweet agony. Out of the medley of my violent feelings and turbulent thoughts, only one word, “Diana!” escaped aloud. 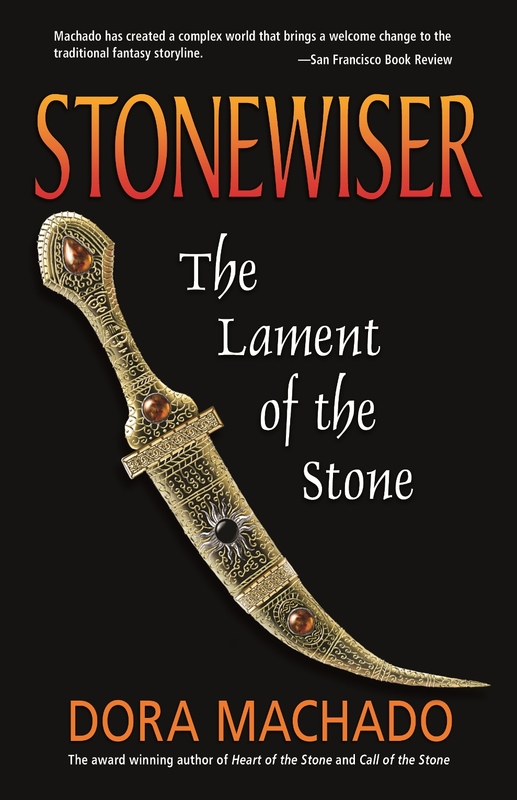 Award-winning fantasy trilogy STONEWISER available FREE on Kindle – get your copies! 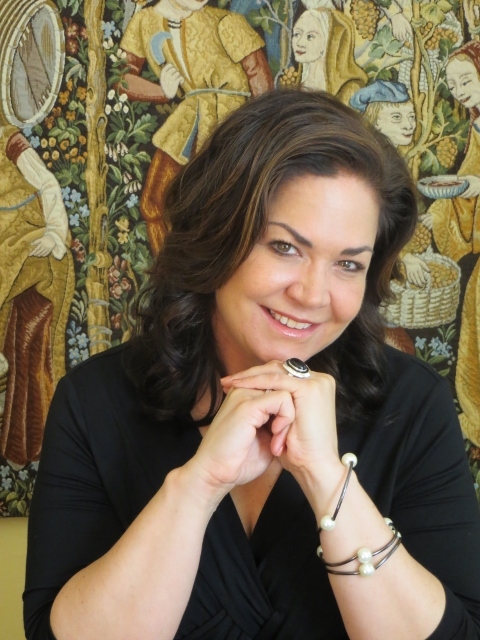 Dora Machado is the award winning author of the Stonewiser series and her newest novel,The Curse Giver, from Twilight Times Books, available July 2013. She is one of the few Latinas exploring her heritage and her world through the epic fantasy genre today. She holds a master’s degree in business administration and graduated Phi Beta Kappa from Georgetown University. She was born in Michigan and grew up in the Dominican Republic, where she developed a bilingual fascination for writing, a love for history, and a taste for Merengue. After a lifetime of straddling such compelling but different worlds, fantasy is a natural fit to her stories. She enjoys long walks, traveling, and connecting with the amazing readers who share in her mind’s adventures. She lives in Florida with her indulging husband and three very opinionated cats. Visit her atwww.DoraMachado.com. For the first time ever and for a limited time, Dora Machado’s entire Stonewiser award-winning fantasy trilogy, published by Mermaid Press, will be available FREE on Kindle.